Though Python is an object-oriented language without fuss or quibble, we have so far intentionally avoided in the previous chapters of our Python tutorial the treatment of object oriented programming (OOP). We skipped OOP, because we are convinced that it is easier and more fun to start learning Python without having to know about all the details of object oriented programming. But even though we have avoided OOP, it had been nevertheless present in our exercises and examples. We used objects and methods from classes without knowing properly about their existence. 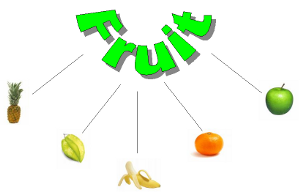 In this chapter we are giving a proper introduction into the object oriented approach of Python. OOP is one of the most powerful tools of Python, but nevertheless you don't have to use it, i.e. you can write powerful and efficient programs without it as well. 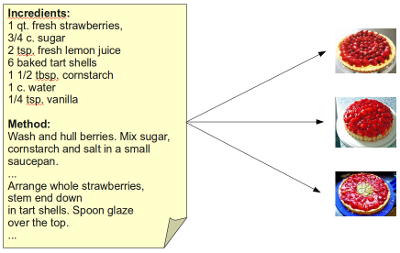 Though many computer scientists and programmers consider OOP to be a modern programming paradigm, the roots go back to 1960s. The first programming language to use objects was Simula 67. As the name implies, Simula 67 was introduced in the year 1967. 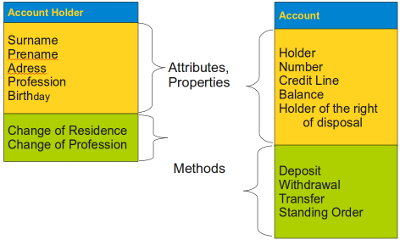 In our illustration we show an example of two classes "Account" and "Account Holder". 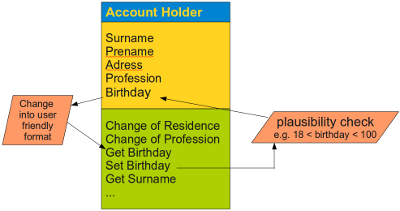 The data of the "Account Holder" consists, for example, of the Holder Surname and prename, Address, Profession, and Birthday. Methods are "Change of Residence" and "Change of Residence". This model is not complete, because we need more data and above all more methods like e.g. 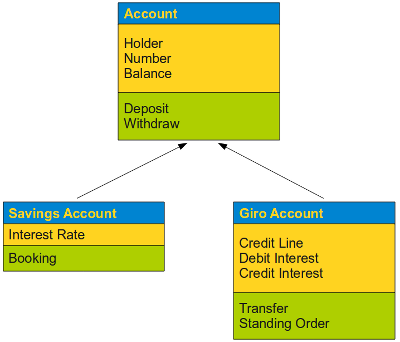 setting and getting the birthday or an account holder. The problems with our methods is that e.g. we deposit 1000,- Euros (or Dollars or whatever currency) or we transfer an amount of 1200.87 to an account with the number 2078987, but nothing really happens. So far we have no way of storing and changing the values.